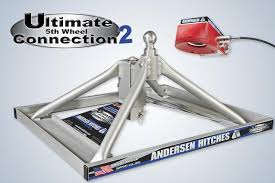 ANDERSEN HITCH ULTIMATE 5TH WHEEL CONNECTION 2 - The Topper Shop Inc. Features new ball-funnel for easy hook up — even works with 3″ off center ball! Our popular Ultimate 5th Wheel Connection revolutionized the 5th wheel towing industry, and is now stronger than ever! And now, you can use our Ultimate 5th Wheel Connection in truck beds with a large fuel tank or toolbox. Each Ultimate 5th Wheel Connection comes with a patented ball-funnel to make hook up even easier! 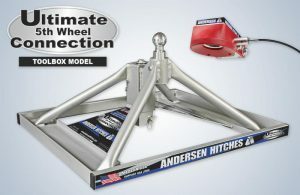 The aluminum Andersen Ultimate 5th Wheel Connection is the lightest, strongest, most innovative 5th wheel hitch in the world! The base weighs just 35 lbs, eliminating the common struggle of getting your 5th wheel hitch into the bed of your truck. In fact, the base of this unit can be completely installed or removed in less than a minute. Andersen Hitches has truly found the solution to making life simple! NOTE: This unit is 4″ lower than the standard Aluminum Ultimate 5th Wheel Connection 2 and is mainly intended to be used with flatbed trucks that have a RECESSED gooseneck ball. 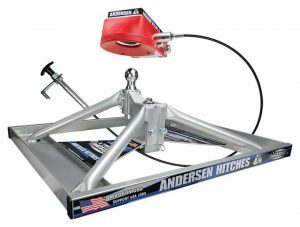 Andersen Hitches revolutionized the 5th wheel towing industry with our popular Ultimate 5th Wheel Connection, and it is now stronger than ever and comes with a patented ball-funnel to make hook up even easier! This “lowered” version is specially designed for use in flatbed trucks with recessed balls.